Kidani Village is a part of Animal Kingdom Lodge. 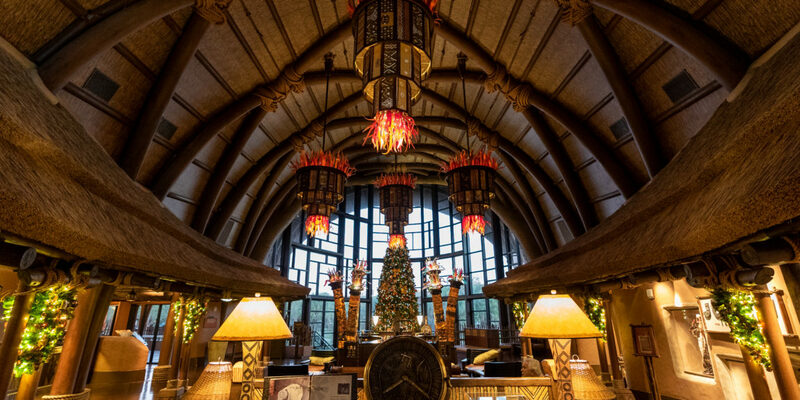 Unlike its sister building Jambo House, the lobby feels small and intimate. Kidani Village, very simply, has the heart of a true Disney Vacation Club Resort. Kindani Village has a small lobby that is elegant and serene. While being decorated heavily in wood, the lobby still manages to feel light and airy, with the help of a massive two story window that overlooks the savanna. Sanaa, which is located on the lower level, is where you can grab a quick breakfast in the morning or have a leisurely lunch or dinner. If you choose to dine at Sanaa later in the day you will need a reservation as it is very popular with non-hotel guests. If you want to know more about dining at Sanaa for lunch, click on this link to read our review. Quick service is not available at Kidani Village but a shuttle does go between Kidani and Jambo House. The shuttle runs about every ten to fifteen minutes, making it easy to stop into Mara for a quick bite to eat. 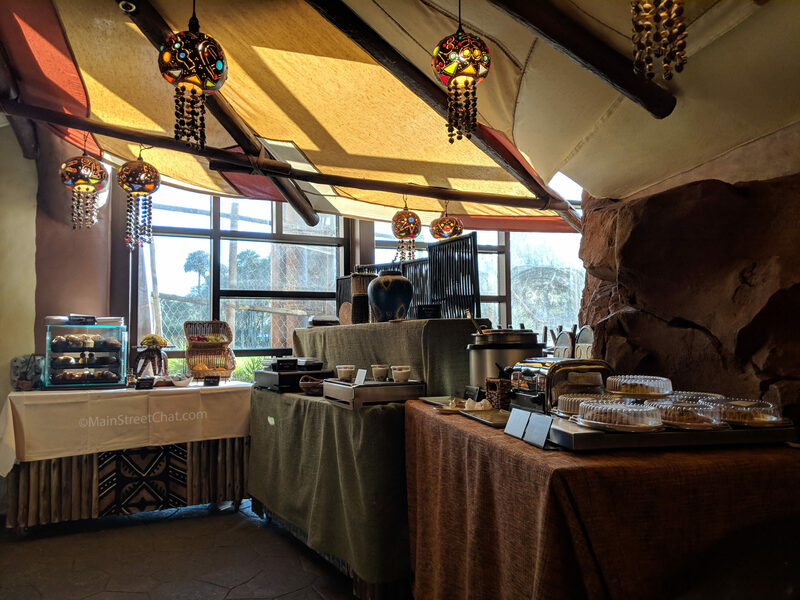 Beyond quick service Jambo house also has Boma , a very popular African inspired buffet and Jiko, the gathering place, which is Animal Kingdom Lodges signature restaurant. 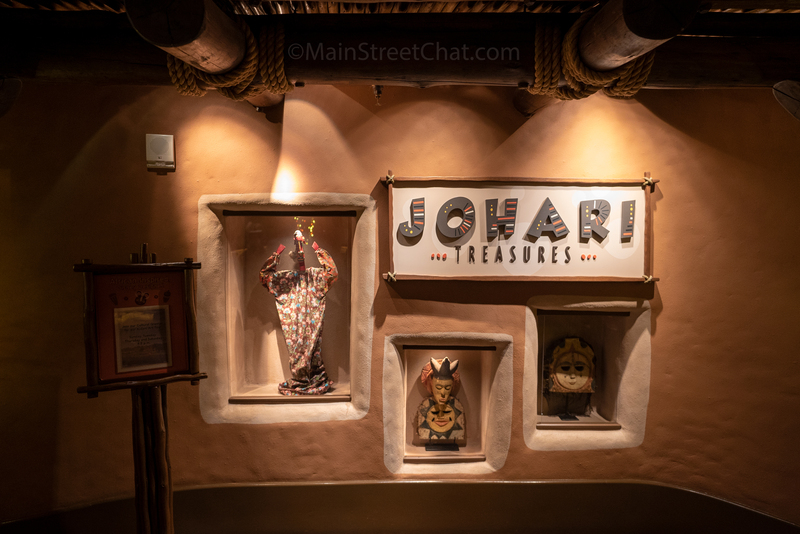 Johari Treasures is the sundry store, located in the lobby, where you will be able to refill your resort mugs, stock up on snacks and grab some wine for a night in. They do not carry a lot of souvenirs or merchandise, with the exception of DVC clothing and some stuffed animals. As a special tip, after Johari closes you can go down the the Sanaa bar to get your resort mugs refilled. 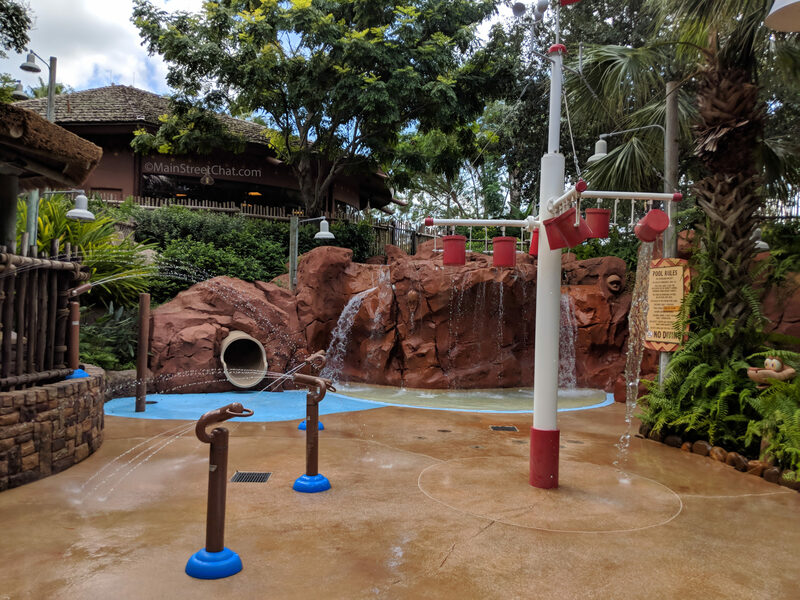 Kidani Village has Samawati Springs Pool, which hands down has our favorite splash pad in all of Walt Disney World. There is so much for young kids to do! Survival of the Fittest Gym is a great way to get your work out in. Did you know that Animal Kingdom Lodge is one of the only resorts that doesn’t have a running path? Let’s not forget about the main attraction at Kidani Village, the Savanna. The views are breath taking and if you are going to be staying for multiple nights and will be spending a few hours in your room every day we whole heartedly recommend spending a little more money for the savanna view. If you can’t swing it then there is lots of great savanna viewing from two porches off of the main lobby, Sanaa, and the Community Hall. Even if you don’t have a savanna view there are plenty opportunityies to see the animals. A basket ball court and arcade also add to the the amenity list. 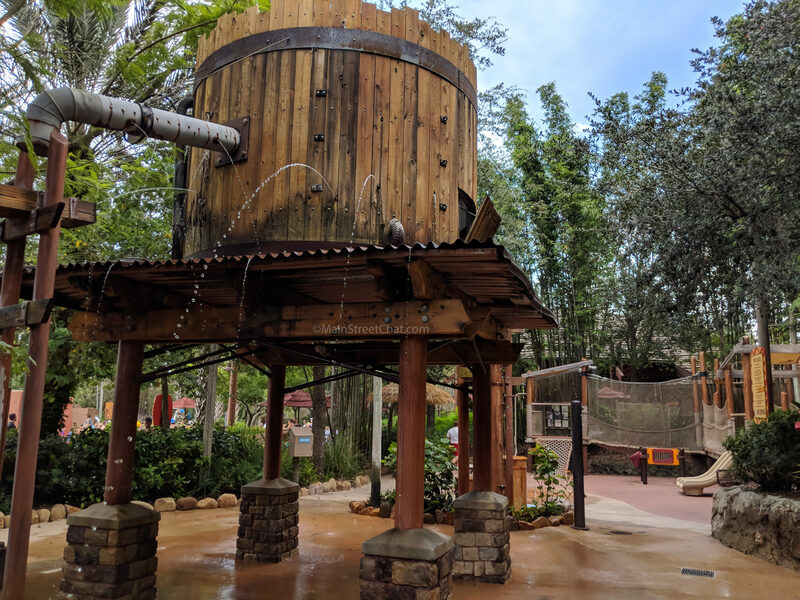 Why does Kidani Village Feel More Like a Disney Vacation Club Resort over Jambo House? Kidani Village has more intimate gathering areas than Jambo House. The Library is a great place to relax, read a book, or just hang out over a cup of coffee. It has a fireplace where we have seen moms with toddlers lay down blankets for their kids to take a nap. It was such a perfect DVC moment it helped solidify why we love Kidani Village. It’s a home and people are able to be at ease. Community Hall is also a huge part of what makes DVC resorts unique. Community hall is where kids can go to unwind. They can draw, do crafts, play video games, play pool, and so much more. Each community hall is different and offers a wide variety of options. We love that Kaitlyn has a place to go to just be a kid and let loose for a while. She truly gets super excited that she can go color after a fun filled day at the parks. Please note that this is not a day care, while there are youth leaders that do work at the Community Halls they cannot watch your children. The one bedroom villa at Kidani Village is by far one of our favorite rooms. At 807 square feet it’s as large as the home I grew up in. In this one bedroom villa you can sleep five comfortably, three in the living room and two in the master. A party of six could fit if you had a child sleeping in a pack and play. Animal Kingdom Lodge has select value rooms, which cost fewer points per night but they are few and far between. They are physically smaller than the standard room equivalent, in this case it can only sleep four. In the kitchen you will find all of your basic cooking needs. Pots, pans, utensils, cooking sheets. Needless to say you have a range, full sized refrigerator, microwave and dishwasher. Small appliances like coffee pot and toaster are also included. If you find that you need a blender or other small appliances you can contact Disney ahead of time and they will let you know if one will be available for you on your trip. They have a limited quantity and one may not be available to you. If you feel like items are missing from the Kitchen check in the cupboards for an allotment list. Should anything be missing, call mousekeeping and let them know. One big advantage of the Kidani Villages one bedroom over Jambo House is that it has two full bathrooms. The master bathroom is larger. Who is going to complain about having two places to get ready in the morning? The second bathroom is a standard size hotel bathroom and none too shabby. The master is pretty much like every other Disney Hotel room with the exception that you get a king bed. That’s right folks, jump for joy, not a too small (with three) queen here. Along with the king bed there is a writing desk, a bureau, and tv. The rooms are equipped with a washer and dryer. All in all it’s a pretty sweet package that we love. We absolutely love Kidani Village. We like how it’s feels small (it’s really not, it has a ton of rooms). Kidani Village has underground parking and it’s really easy to get to your room. You can park in sections, like Timon ,and an elevator will drop you off close to your room. We really appreciate the cast members that work here, the majority of them have been truly amazing. We have a bar tender that we adore. A lot of the cast members who work at Johari are very friendly and ask you what you have planned for the day while you’re getting coffee in the morning. Our least favorite aspect about Kidani Village is that it doesn’t have a quick service option. Sometimes you just don’t feel like getting on the bus after a long day at the parks. Room service here is bad. 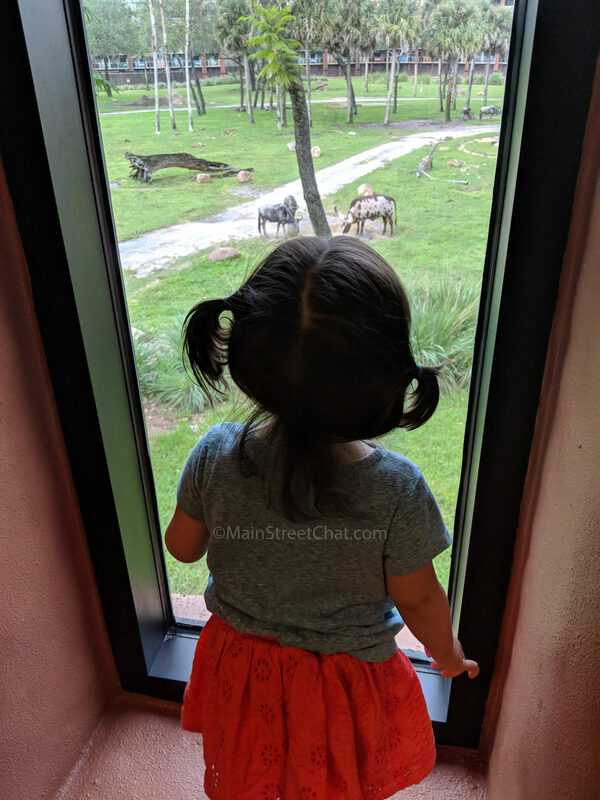 This was so sad, Jambo House has the best room service we’ve ever eaten. Location of resort, with young kids the long commute between resort and park may be taxing. With the exception of Animal Kingdom Park. Have you guys stayed at Kidani Village before? What do you like best about it, what do you like the least? 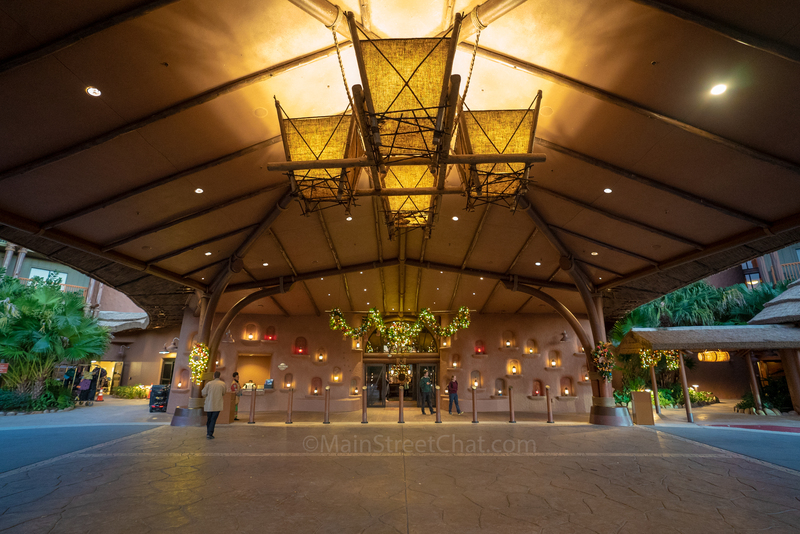 Want to know about Animal Kingdom Lodge? Click here. 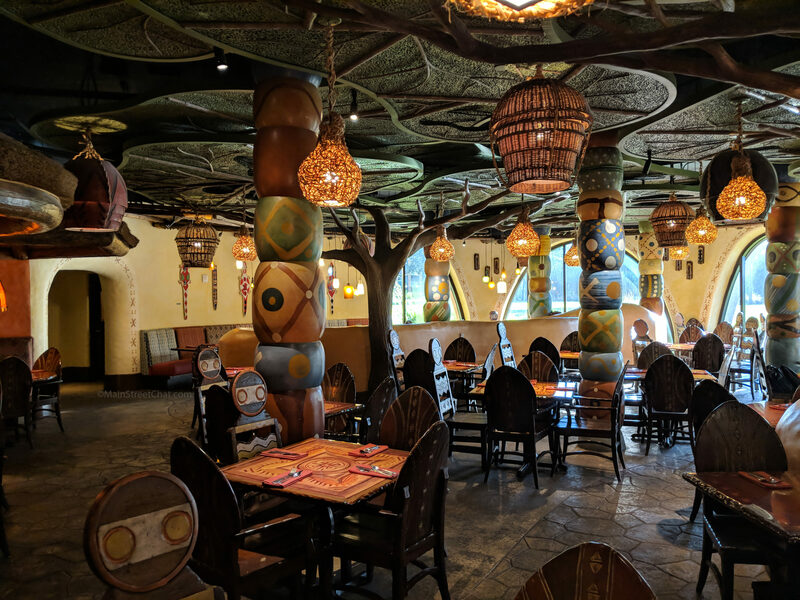 Check out our Animal Kingdom Lodge dining reviews for: Boma Breakfast, Dinner, Sanaa, and The Mara.